An archenemy is the principal enemy of someone or something, often in stories it is the protagonist's most prominent and worst enemy. Captain Hook is such an archenemy of Peter Pan in J.M. Barrie’s play; Peter Pan, or the Boy Who Wouldn’t Grow Up. The play's subtitle underscores the primary theme, which is the conflict between the innocence of childhood and the responsibility of adulthood. Peter Pan has literally chosen not to make the transition from one to the other and a question might be if we, deep in our soul ever grow up? When it comes to close-hooks there are, far reached and with a bit of fantasy, a certain relation, because when it comes to tidying up our home we might need to be hooked by a sense of order to prevent chaos . We must grow up to see a distinction between precaution and prudence of tidiness. We all have it deep in our memories those loud cries of anger and despair from our parents. “Get the mess cleaned up!” Even as adults we might now and then have this inner archenemy speaking to us when our home looks like a bomb strike. We are all prone to this childish disregard for order and tidiness and thus need a Captain Hook! This was the thought of the designer Carsten Jörgensen when in 2011 he made the first sketches to a close hook that could be used throughout the home. It was his personal reflection of what you do and what you need when you come home, or when you take a bath in the morning. When you go to sleep or when you come into your home office… yes everywhere there might be a cry from an imaginary Captain Hook. Coming home from a long day's work, there are the keys, the loose coins in the pocket, the sunglasses, the coat, maybe a hat umbrellas. There are scarves in the winter and not least the bag, which seems to hide somewhere forgotten. There isthe Dalmatian dog named Coco who has been waiting with longevity for the morning walk , but doesn’t leave without its red leash and by the way, where are the poly bags of subtle matters? In the bathroom you find damp towels stinking on the floor. Where to place the watch and the glasses and the jewellery?Going to sleep the jeans, shirt and jacket on hangers? The tie – the phone – and the crumpled not-to-forget note! Captain Hook is always there with his hook and storage stretched out to remind you of being tidy! Untidiness is banished to “neverland”! Made of injection-moulded melamine with a mat finish in black and white the storage shelf is big enough to get your hand in to grasp whatever is stored. Captain Hook is a hand length long, meaning 16 cm in depth and has an opening of 6.5 cm high and 9 cm wide equalled the width of the hand without the thumb. The hook are made of cast aluminium, with a matt sandblasted surface and is provided with 6 concave 0.5 cm deep recesses to prevent cloth hangers to slide out. To secure a steady hold on a wall the aluminium hook isprovided with four holes in which you place the four stainless steel screws and four wall plugs included in the gift box. Captain Hook can be easily mounted with a bit of drilling skills to any kind of wall materials as long as it has a smooth surface. 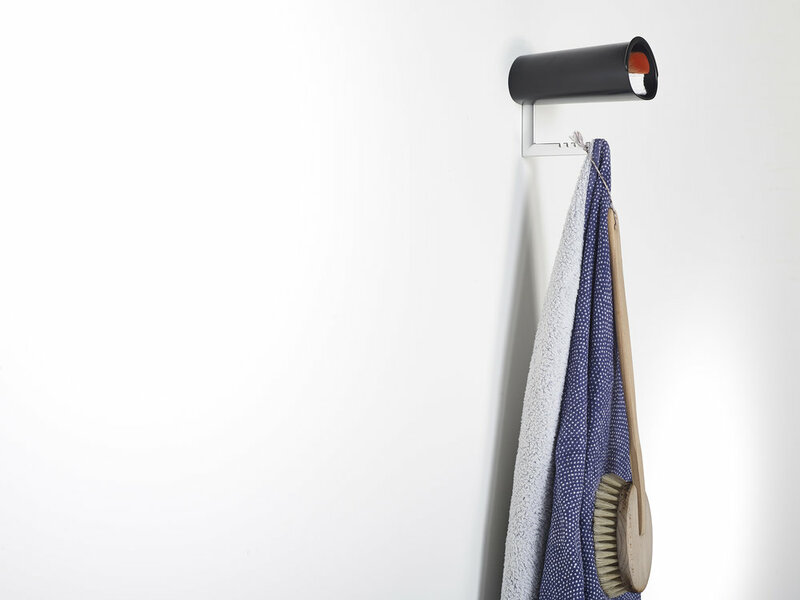 The storage shelf is easily fitted to the erected hook by simply sliding it over the hook. The storage shelf can be removed for cleaning and cleaned with conventional dishwasher soap and a rag or soft brush. You will findinstructions for mounting Captain Hook in the gift box or on this web page under directions for use menu. Melamine, also called cyanamide or triamino triazine, is a colourless crystalline substance belonging to the family of heterocyclic organic compounds, which are used principally as a starting material for the manufacture of synthetic resins. Melamine is rich in nitrogen, a property that is similar to protein. Melamine formaldehyde or melamine resin (short Melamine or MF) is a hard, very durable, and versatile thermosetting plastic (aminoplast) with good fire and heat resistance. It is made from melamine (an organic material) and formaldehyde by condensation of the two monomers. It's good fire retardant properties are due to the release of nitrogen gas. When exposed to heat, melamine degrades and releases nitrogen and the freed nitrogen takes the place of oxygen in the surface air surrounding the material, which prevents the material from burning. Melamine resins are used for the manufacture of many products, including kitchenware, laminates; overlay materials, particleboards, and floor tiles. Melamine is also used in the manufacture of flame-resistant materials. These include textiles such as upholstery, firemen uniforms, thermal liners, and heat resistant gloves and aprons. Melamine and its salts are also used as fire-retardant additives in paints, plastics, and paper. The FDA considers melamine safe, but this does not account for other sources that can build up melamine in the body. We have been using melamine for Captain Hook because of its excellent stability and fire retardant qualities, which other thermoplastics do not have at the same degree. Melamine is a durable material therefore perfect for daily use and it has the same abilities to age beautifully as natural materials such as wood. Melamine resins were initially discovered by William F. Talbot, who applied his patent in 1936. Since Captain Hook isn’t heated to a degree that chemicals contained are evaporated into the air we consider Melamine the best material for this specific use. It will not harm your health in any negative way. Aluminium is a silvery-white, soft, nonmagnetic metal. By mass, aluminium makes up about 8% of the Earth's crust and is the third most abundant element after oxygen and silicon and the most abundant metal in the crust. It is found combined in over 270 different minerals. The chief source of aluminium is bauxite. Aluminium is remarkable for its low density and its ability to resist corrosion. Food is the most important source of aluminium in the human body, next to medicines that contains aluminium. Most of the intake of aluminium from food comes from the natural content of aluminium in fruit and vegetables. In Europe, the daily aluminium intake from food is estimated at 3-10 milligrams. The amount of aluminium we get in our bodies from cans, foils or saucepans is small and amounts approximately to 0.1 mg a day. Aluminium is a natural component in surface and groundwater. However, aluminium in water is less than 1 percent of our daily aluminium intake. High levels of aluminium in the body have been shown to have neurotoxiceffects on bone and possibly reproduction. It has been argued that brain tissue through high aluminium intake eventually could cause Alzheimer's but it has been opposed by other studies that show no relation. Today’s research does not support suggestions to exclude commonly used aluminium products. An exception is patients with kidney failure, who should avoid aluminium entering their bloodstream through dialysis. Although ancient Greeks and Romans used aluminium for dyeing and dressing wounds, it is three names, which shall be mentioned for the availability of aluminium. The metal was first produced in 1825 in an impure form by Danish physicist and chemist Hans Christian Ørsted. Friedrich Wöhler a German was aware of these experiments and conducted similar experiments in 1827 by mixing anhydrous aluminium chloride with potassium and produced aluminium. Wöhler is therefore generally credited with isolating aluminium! In the mid-1880s, aluminium metal was exceedingly difficult to produce, which made pure aluminium more valuable than gold. We have chosen aluminium because of its durability,strength and lightweight. The aluminium alloy used for the hook has the following composition. Aluminium - %, Zinc - % and can not under the proposed usability as a hook for clothes etc. harm your health in any negative way.